Here at Audio Garage, we are always evaluating the latest products to meet the needs of our clients. Audio upgrades for motorcycles are a fast-growing market- especially for Harley-Davidson Motorcycles. In 2014, Harley changed the audio configuration for the audio systems on the Street Glide and Road Glide models. Unfortunately that makes them more difficult to work with. 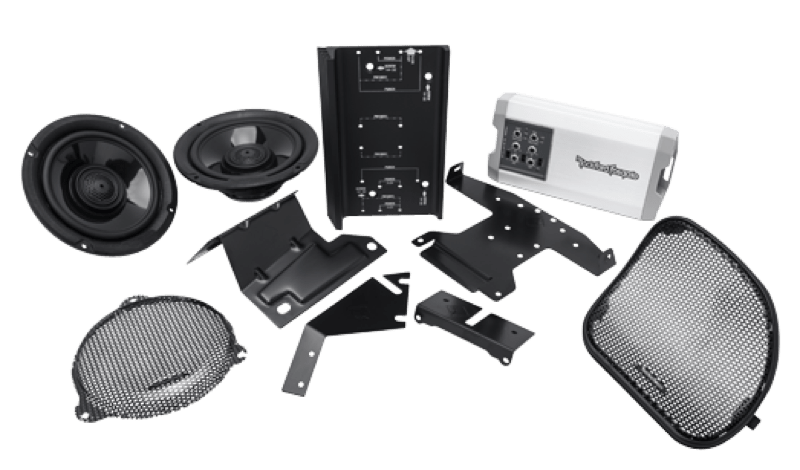 Rockford Fosgate has reacted to that and is now offering the HD14TKIT as a solution. Rockford has thought of absolutely everything with this kit. Harley owners concerned about their 24- month factory warranty will have no worries with the Rockford wiring kit included in the package. It allows you to plug into the factory harness and not disturb the factory wiring. The new upgraded front speakers bolt directly into the factory holes with no drilling necessary. The small marine-grade amplifier even comes with a custom bolt-in mounting bracket with an additional heat sink to help keep the amplifier cool. 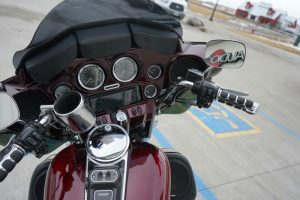 Rockford uses a high-tech computerized design program to create the optimum speakers for Harley-Davidsons. This achieves maximum performance. The carbon-fiber reinforced cone and neodymium tweeters are weather and sun resistant. The speakers are rated at 75 watts continuous and 150 watts peak. They even come with custom grills for an exact fit on your Road Glide, Street Glide, or rear Tour-Pak locations. This system comes with the Rockford Fosgate TM400X4ad amplifier delivering 100 watts into four channels. It is flexible and can also be bridged to 200 watts into two channels. The amplifier uses Rockford’s Class AD technology to allow for a very small and efficient amplifier that works well with the Harley’s electrical system. The amplifier mounts in a small closed location so the twin cooling fans and thermal protection are very useful. This is in addition to the extra heatsink that comes on the custom amp mounting plate. There are high-pass and low-pass crossovers that can be useful with bi-amping or upgrading your system in the future. 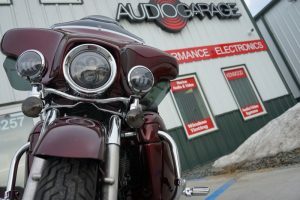 Come on by Audio Garage and let our sales and installation experts show you the Rockford Fosgate HD14-TKIT for your Harley-Davidson Motorcycle. Come by and check out the solutions we have for whatever vehicles you own or ride! Click here for more information.